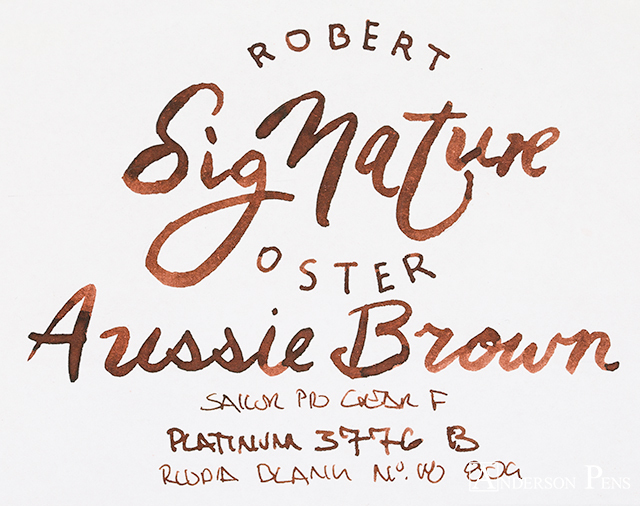 Hop on Down (Under) and take a tour of Robert Oster Aussie Brown. 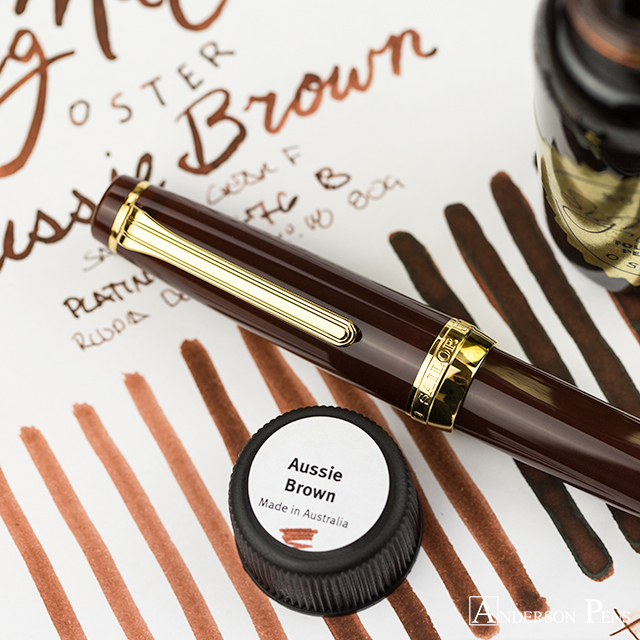 Aussie Brown is one of the latest offerings from Robert Oster. It is a nice neutral brown color that plays well in all nib sizes. 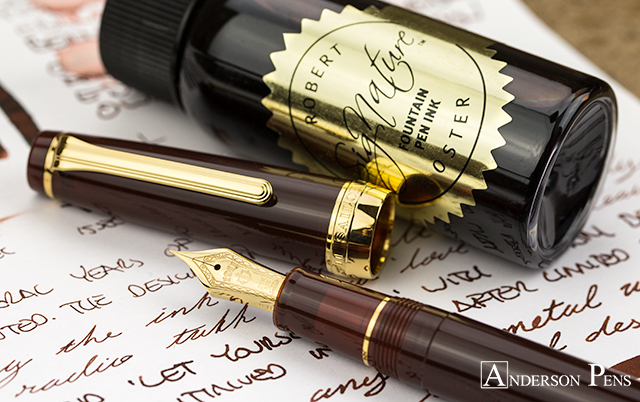 Robert Oster ink is produced by its namesake in Australia. The ink comes in a 50ml plastic bottle that is easy to fill from. This review was done with a Sailor Pro Gear F, Platinum 3776 B and on Rhodia blank No.18 paper. 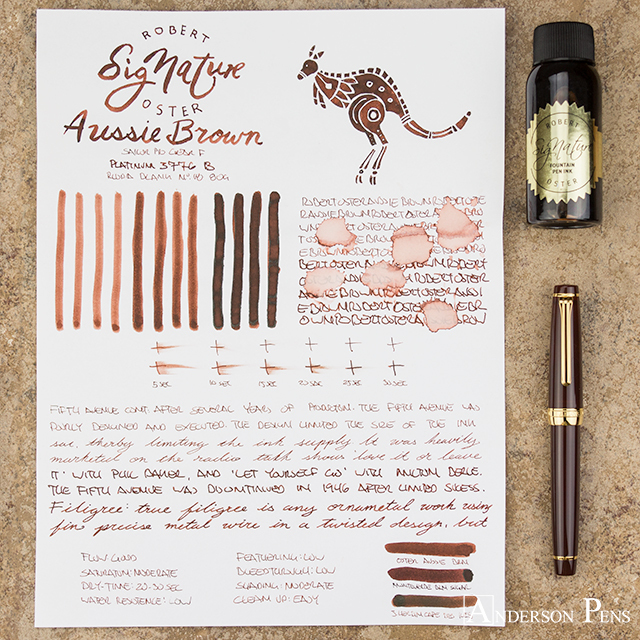 Aussie Brown has a fairly consistent color in both a fine and broad nib. The ink has a limited but lovely range of shading. 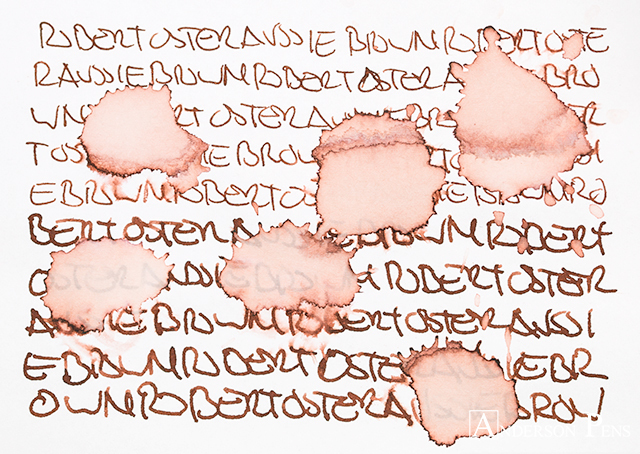 At its lightest the ink is a light cinnamon. The ink then shades to a darker pecan before arriving at its darkest color, a rich hickory brown. 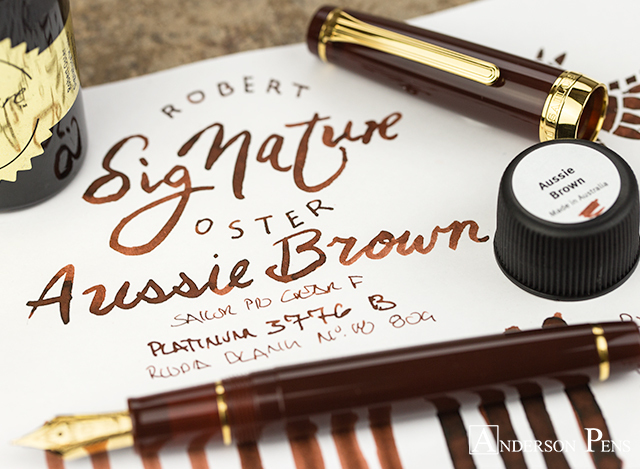 Robert Oster inks tend to perform very well, and Aussie Brown continues the trend. There was good flow with no feathering or bleedthrough. It’s a moderately saturated ink with good dry times at 20-30 seconds. While the ink had no water resistance, clean up was very easy. 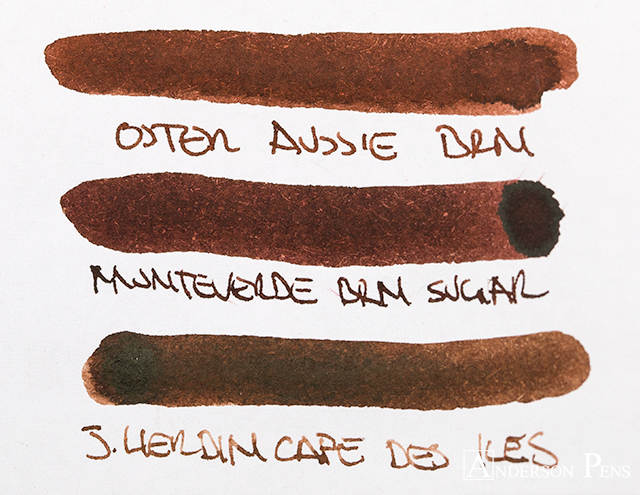 As you can see from the comparisons above you can go crazy trying to find the perfect brown ink. 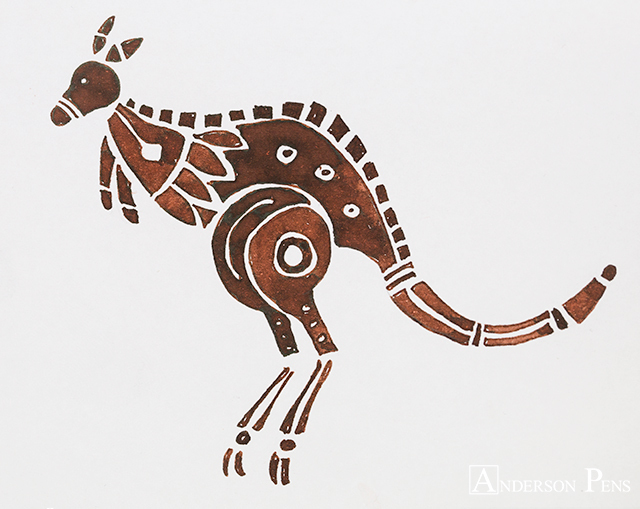 Aussie Brown doesn’t have any extreme shading or sheening, but it is a very nice color and is enjoyable to use. It might just be the perfect brown for you! As with any ink review, the pen, paper, and person doing the writing will influence the way the ink looks. 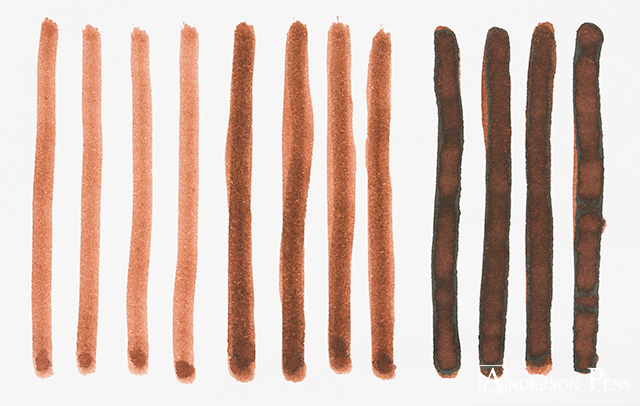 If you’re not sure about a color, try a sample to see if it’s the one for you. New to thINKthursday? No problem – I explain the formatting of my reviews here. This entry was posted in Ink, Ink Reviews, thINKthursday and tagged ink, ink review, Robert Oster, Sailor, thINKthursday. Bookmark the permalink.